Geeta Jayanti 2018: Final program tonight! We were truly blessed to start our Geeta Jayanti celebrations by having had a full Geeta Havan this morning from 9.00am – 1.00pm, where all 18 chapters of the Bhagavad Geeta were recited. 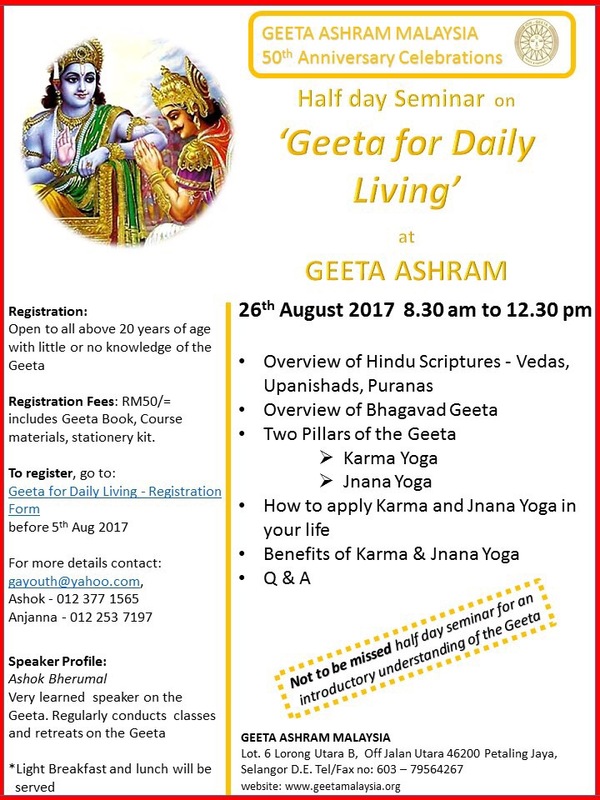 For those of you who were unable to make it, not to worry – there’s still time to celebrate the auspicious day of Geeta Jayanti today! We would like to welcome one and all to join us for the final day of the Geeta Jayanti celebrations, tonight from 6.30 pm to 9 pm. We will be starting with the Hanuman Chalisa first at 6.30pm, followed by the Geeta Jayanti Programme from 7.00pm onwards. The commentary for Chapter 18, will be by the High Commissioner of India, H E Mridul Kumar. Disseminating the Immortal Message of the Geeta; Children’s Classes begin! Our Children did an amazing job showcasing the fruits of Swamiji’s dedication and the teachers’ hard work with the children’s classes. We will be starting our classes for year 2018 on Sunday, 14th January 2018. Classes are from 11.15 am – 12.30 pm every Sunday. More information on our classes here!